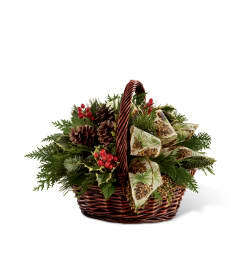 Stacking the odds of holiday fun in your recipient's favor, this fresh flower bouquet is a Christmas favorite that never goes out of style. 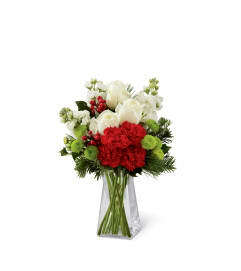 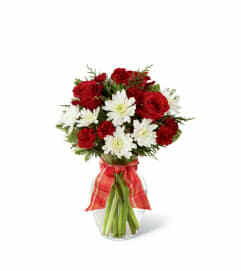 Frilly red carnations are paired with red Peruvian Lilies surrounded by green button poms, variegated holly, and an assortment of fragrant Christmas greens. 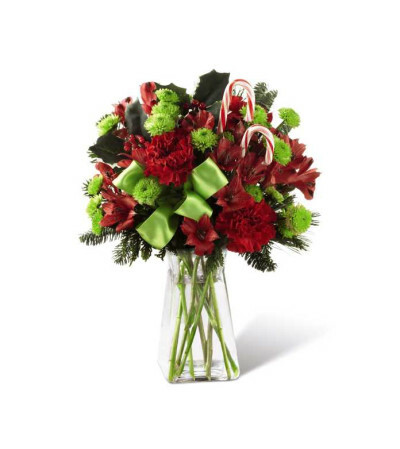 Accented with a bright green satin ribbon and classic candy canes, this festive holiday bouquet is that perfect way to say, "Merry Christmas," to the ones you love throughout the yuletide season.